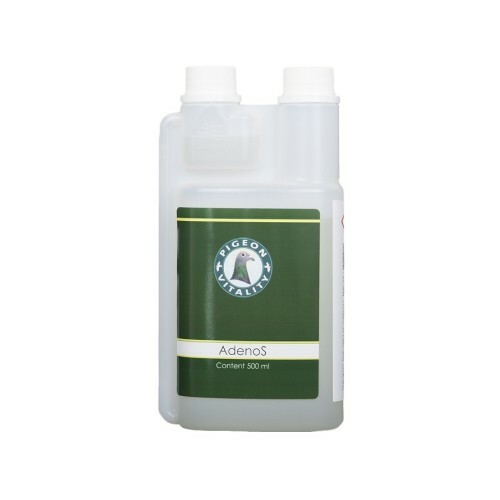 AdenoS 500ml by Pigeon Vitality is a 100% natural combination of lactic acid and the famous Pigeon Vitality Improver. This powerful combination does not kill the virus, but it does contribute to the sick pigeon surviving and after 2 weeks develop immunity to the virus. NOTE: It is important to combine AdenoS with Pigeon Vitality Belgamax, to enhance the effectiveness of the treatment. - Treatment in pigeons that present symptoms of adenovirus: 5 ml per 1 liter of water for 5-6 days or until the symptoms subside. Combine with Belgamax: 1 teaspoon per 1 liter of water. - Preventive: Administer 5 ml of AdenoS per 1 liter of water 3-4 times each week. - During the competition season: Administer 5 ml of AdenoS per 1 liter of water 3-4 consecutive days after returning.